It sounds contradictory: Cushing’s disease is caused by high levels of cortisol (the stress hormone) in the blood, but high levels of stress do not directly cause Cushing’s disease. With Cushing’s, it’s only a disease if the elevated cortisol is caused by a pituitary gland tumor or an adrenal gland tumor. Either way, though, uncontrolled high cortisol levels in your body are damaging. Cushing’s disease is caused by excess cortisol in the blood. It’s rare: According to the National Institutes of Health, only 40 to 70 people out of 1 million have Cushing’s disease. Most are women between the ages of 30 and 50, but men and even children also get Cushing’s disease. Cortisol is the “stress” hormone, a steroid. It is normally released during changes that occur throughout the day, including waking up in the morning, exercising, and stressful situations. It’s highest in the morning and lowest at night. With Cushing’s disease, cortisol levels remain elevated. Those with high blood cortisol levels often have excess fat and insomnia. Cortisol’s role in the body is to maintain homeostasis. It elevates, along with the hormone adrenaline (epinephrine), when the body feels stressed—during heavy exercise, for example, or a fearful situation. The adrenaline perks us up to deal with the stress at hand, while cortisol goes to work protecting the body (regulating blood sugar, prompting an immune response). When stress is alleviated, adrenaline and cortisol levels are supposed to normalize. If that doesn’t happen and cortisol levels remain high, symptoms of Cushing’s disease can begin to appear. Having any these symptoms, however, doesn’t mean you have Cushing’s disease. When the symptoms are caused by high cortisol from stress or medications (oral corticosteroid/glucocorticoids drug, such as prednisone), it’s called Cushing’s syndrome. A “syndrome” is a cluster of symptoms that often appear together. Metabolic syndrome—elevated blood sugar, excess weight, high blood pressure, and high trigycerides—includes symptoms typically found in diabetes, but metabolic syndrome is a risk factor for the disease, not diabetes itself. If the problem is Cushing’s syndrome caused by medication, stopping the drug can relieve the symptoms. However, it’s important to realize that your body has probably become used to the drugs, so the drugs must be gradually stopped in order for the pituitary and adrenal glands to regain normal function. The system that controls cortisol release in your body is called the “hypothalamic-pituitary-adrenal axis,” which is a three-part system responsible for controlling stress and regulating body processes. With cortisol, when the hypothalamus (a tiny but powerful portion of the brain that controls your body’s internal balance and regulates hormones, body temperature, fluid levels, electrolytes, heart rate, and more) detects low adrenocorticotropic hormone ACTH, it sends cells to stimulate the pituitary (a gland located in the brain) to produce ACTH. The released ACTH then stimulates the adrenal glands (located on top of the kidneys) to produce cortisol. “Pituitary gland tumors: A benign (non-cancerous) tumor of the pituitary gland can secrete an excess amount of ACTH, which can cause Cushing’s syndrome. Also known as pituitary adenomas, benign tumors of the pituitary gland affect women five times more often than men. Don’t be surprised if your physician doubts you have Cushing’s disease. For one thing, the incidence of true Cushing’s disease is very low. For another, many of the symptoms closely mimic other problems, like metabolic syndrome, prediabetes, and polycystic ovarian disease in women. Your physician will do a full examination and ask pointed questions about your medical and family history. Laboratory tests—both blood and urine—will be ordered to assess the levels of both ACTH and cortisol in your body. Saliva tests may be done to monitor the cortisol in your body at different times of the day. As stated, cortisol is usually highest in the morning and lowest at night. With Cushing’s disease, or Cushing’s syndrome, cortisol levels remain consistently high. A blood-serum cortisol test can also be done around midnight to get a specific reading of cortisol during the time it should be low. A dexamethasone suppression test may be done to determine if ACTH secretion can be suppressed. A dexamethasone-corticotropin-releasing hormone test will look at cells produced by tumors versus normal cells. Cushing’s disease is named for Harvey Cushing, the neurosurgeon who first described this endocrine disorder in 1912. According to the Pituitary Society, the best test to confirm Cushing’s disease is the inferior petrosal sinus sampling (IPSS), which measures ACTH levels in the veins that drain the pituitary gland compared to the veins in the chest. This test is invasive. “This test involves inserting small plastic tubes into both the right- and left-sided veins in the groin (or neck) and threading them up to the veins near the pituitary gland. Blood is then taken from these locations and from a vein not close to the pituitary gland. During the procedure, a medication that increases ACTH levels from the pituitary is injected. By comparing the levels of ACTH produced close to the pituitary gland in response to the medication with those produced by other parts of the body, the presence or absence of a pituitary tumor can be determined,” says the Pituitary Society. If these tests confirm the diagnosis of Cushing’s disease, more specific blood tests and pituitary imaging (usually an MRI) may be done to try to determine the exact cause location of the tumor. If no tumor is found, the diagnosis will likely remain Cushing’s syndrome. According to uptodate.com, “The treatment of Cushing’s syndrome depends upon the underlying cause. Treatment can reverse most of the symptoms of Cushing’s syndrome, although this must be done carefully to minimize the possibility of permanent hormone deficiency and treatment side effects.” While drugs are available to reduce cortisol levels, the drugs, when given alone, do not work well as a long-term treatment. The only universally reliable treatment for Cushing’s disease is surgical removal of the tumor causing the abnormal release of cortisol. The surgeon’s skill is very important. If the tumor is not completely removed, there is a chance (about 15 percent) that it will return. Radiation is often used following the surgery. If removing the tumor isn’t successful, surgery to remove the adrenal glands may be performed. After surgery, those patients often need glucocorticoid therapy to cope with the loss of the cortisol. Without treatment, Cushing’s disease can lead to a shortened lifespan and reduced quality of life. 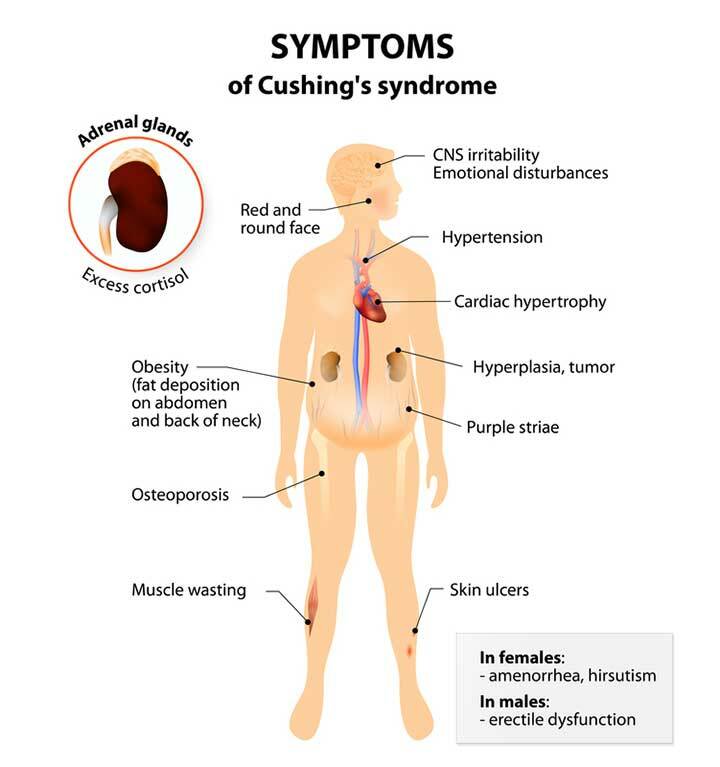 Cushing’s disease, or actually the high cortisol, also can cause other problems, including kidney stones, spinal compression fractures, infections, bone loss, muscle weakness, and high blood pressure. Cushing’s disease is found not only in people, but in horses, cats, and dogs. Among those animals, it’s most common in dogs, with approximately 100,000 cases diagnosed each year, according to the University of Wisconsin Veterinary Medical School. Cushing’s disease symptoms show up in affected dogs around the age of 10 to 11. The typical scenario is an older dog brought into the veterinarian because he or she is overeating, over-drinking, and developing a “pot belly.” He may also show hair loss with darkening skin beneath and/or dark spots on the abdomen. Additional symptoms include lethargy, panting, and skin infections. If Cushing’s disease is due to an adrenal tumor (15 percent of dogs with Cushing’s disease), the average age of diagnosis is 11, with most dogs weighing more than 44 pounds. Typical breeds include Poodles, Dachshunds, Beagles, German Shepherds, Boxers, Boston Terriers, Labrador Retrievers, and terriers. Canine Cushing’s disease is usually triggered by a pituitary tumor (85 percent of cases), which causes the over production of ACTH that then stimulates the adrenal glands to produce too much cortisol. Diagnosis is made by symptoms, blood tests, and possibly an ultrasound, especially if the tumor is believed to be on the adrenal gland instead of the pituitary. Vetoryl (trilostane) stops the production of cortisol and can be used whether the cause is a pituitary or adrenal tumor. Lysodren (mitotane) is a human chemotherapy drug that destroys the layers of the adrenal gland that produce cortisol. It requires careful monitoring and can have severe side effects, according to the FDA. “Once treatment has been initiated, the symptoms of Cushing’s disease slowly dissipate,” says Jeff Grognet, DVM, co-owner of Mid-Isle Veterinary Hospital in Qualicum Beach, BC, Canada, in Dogster magazine. “The first thing is that the drinking falls dramatically. It takes longer for the skin lesions to resolve. acne, adrenaline, aging, anxiety, blood pressure, blood sugar, bone, bone loss, brain, cancer, chemotherapy, children, cholesterol, cognitive decline, cortisol, depression, diabetes, elevated blood sugar, elevated cortisol, erectile, erectile dysfunction, excess cortisol, exercise, glucose, hair loss, headaches, health, high blood pressure, high blood pressure and, high cortisol, high cortisol levels, hormone, hypertension, infertility, insomnia 2, kidney stones, low libido, lung cancer, metabolic syndrome, mood, muscle, ovarian disease, overeating, polycystic ovarian disease, prediabetes, radiation, side effects, sinus, skin, small cell lung cancer, stress, stressful situations, sugar, too much cortisol, tumor, weight gain.